This product is replaced by a new version: Grove - Starter Kit V3. As an open source hardware facilitator, we dedicate to make electronic prototyping easy and fast. We believe more effort should be put on concepts design rather than how to build basic circuits especially in the idea phase. This Grove Starter Kit Plus is a upgraded version of our Grove Starter Kit. 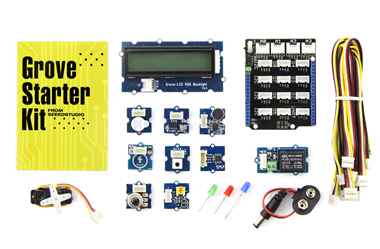 We included more frequently encountered modules in this kit to support your concept buildup. Meanwhile, we totally refreshed the whole image of this kit with eye-catching green and user-friendly booklet and stickers. If you were ever held back by the serious face of electronic modules, then it's time to review the point and discover the new face of it.